Our fantastic indoor Field Turf field is an option to bring almost any sport or activity inside during the cold, snowy winters. 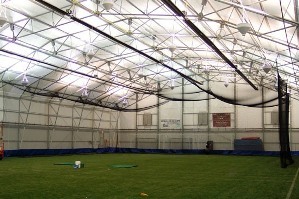 We’re able to rent half the field, full field, our party room and our baseball batting cage. Rent per day or set up a long term rental and take advantage of longer term rental discounts! Uses are almost limitless but need to be approved by managment before taking place. Long Term Rental Fees are determined on an individual basis. Please contact Kim Foley to schedule a rental or ask any questions at kfoley@seacoastunited.com or by phone at 207-361-8178.